Ashley & Muhammad rev up for U.S. Championship! 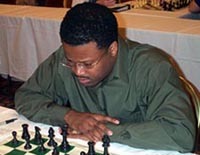 Both GM Maurice Ashley and FM Stephen Muhammad have established themselves over the years in all the major U.S. tournaments. Perhaps none of these tournaments will have the historic relevance as the 2003 U.S. Championship to be held in Seattle, Washington (January 9-18th). Both Ashley and Muhammad will compete with the nation's best and have the distinction of being the first two players of African descent to compete in the prestigious tournament. 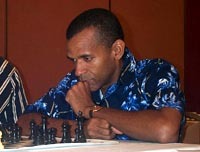 GM Ashley earned his GM title in 1998 and his story is now well-known. Coming off of a stirring win in the recent King's Island Open, he will put his creative and attacking style of play on display. Long an icon in the Black community, Ashley has always led by example while serving as a successful coach. Perhaps winning this title could be yet another accolade to add to a storied career. FM Muhammad will be playing in perhaps the biggest tournament of his life. Those who have followed Muhammad know that he is very capable of putting together a 2600-level performance. The key for Muhammad will be getting off to a decent start and picking up momentum in the later rounds. He seems to excel in pressure situations. Both of these players are to be commended for their pioneer status and will set the bar higher for young players to achieve for higher heights. Both of these men are very successful role models and the world will certainly be watching the progress of these two chess mavens.